Clickstreams, also known as clickpaths, are the route that visitors choose when clicking or navigating through a site. A clickstream is a list of all the pages viewed by a visitor, presented in the order the pages were viewed, also defined as the ‘succession of mouse clicks’ that each visitor makes. A clickstream will show you when and where a person came in to a site, all the pages viewed, the time spent on each page, and when and where they left. Taken all together, as aggregated statistics, clickstream info will tell you, on average, how long people spend on your site, and how often they return. It will also tell you which pages are the most frequently viewed. An interactive clickstream is a graphic representation of a clickstream; a list of pages seen in the order in which they were visited. The graphic allows you to click on the pages, and see what the visitor saw, hence the label ‘interactive’. The most obvious reason for examining clickstreams is to extract specific information about what people are doing on your site. Examining individual clickstreams will give you the information you need to make content-related decisions without guessing. There is a wealth of information to be analyzed, you can examine visitor clickstreams in conjunction with any of the information provided by a good stats program: visit durations, search terms, ISPs, countries, browsers, etc. The process will give you insight into what your visitors are thinking. Q: What are people who enter my site with specific search terms doing when they get there? A: Clickstream analysis will answer this question, and give you the opportunity to identify the search terms that are the most valuable for your site, by actually telling you how they perform. For example, if you sell widgets, and notice that a lot of people type in ‘blue widgets’ but leave without buying any, then you need to figure out why. Clickstream analysis will tell you where they come in, what they look at, and where they leave. It is up to you to figure out why they leave (also known as ‘shopping cart abandonment’). Maybe it’s because you don’t sell the particular model of widget they are after, which you may be able to see from the search term they entered. You might also find, for example, notice that the visitors who are leaving all have screen resolutions of 800 x 600. Therefore, if you re-design your product display page, your visitors will be able to see the product pictures more easily. Q: Why is my site not giving me the results I expect? A: Perhaps you have a newsletter, and you would like your visitors to sign up, but nobody is signing up. Clickstream analysis will allow you to re-enact visitor click-streams. This ability to see exactly what your visitors see, and the order in which they see it, is great way to trouble shoot. You might notice for example, that most visitors only spend a few seconds on the newsletter sign-up page, or the page before it. The information that nobody spends any time on a page tells you that an update is necessary. It tells you whether or not you are including the correct amount of information on your pages. This is a crucial aspect of any website. 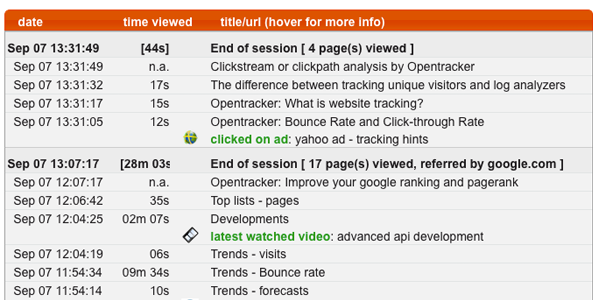 Our clickstream analysis gives you access to visitor clickstreams live, in real-time, while they are happening. If you login to our demo now, you will be able to see your own clickstream through our site (as you read this!) by going to visitors online. We have built an interactive tool that lets you see all the visitors on your site in real-time, those both online and offline. Every visitor is represented by an icon. If you click on any visitor’s icon, you will see a graphic representation of their clickstream. You will also see that visitor’s profile, which consists of their country of origin, their ISP, technical specs, the frequency of visits they have made to your site, the search engine and search terms that they might have used. You will also know if they are a first-time visitor, and view the details of their visit, i.e. the times they entered and left. From all this information, it is possible to extrapolate any number of conclusions and understandings of what visitors are doing.